A palatable, aniseed flavoured aqueous fenbendazole suspension for oral administration. 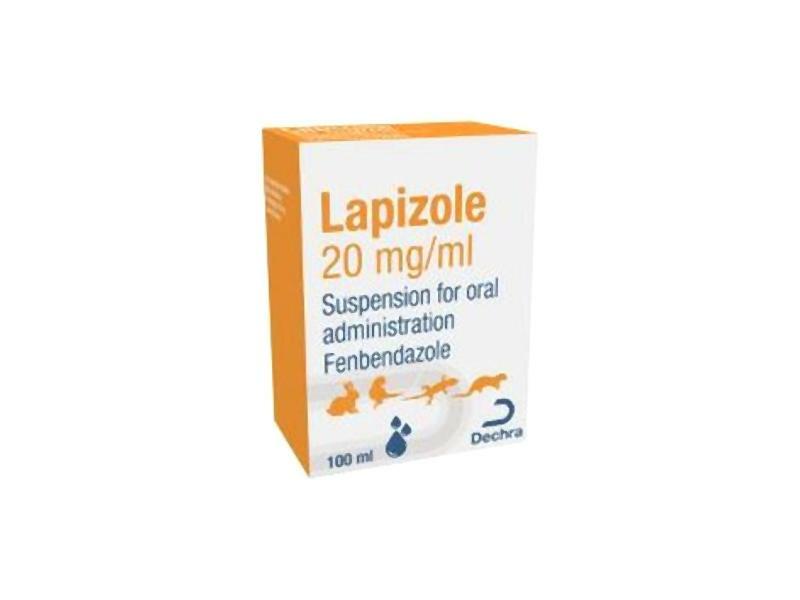 Lapizole is a broad-spectrum, oral anti-parasiticide for administration in the prevention and treatment of infections caused by internal parasites of rabbits, ferrets, birds, reptiles including Encephalitozoon cuniculi. Rabbits, birds, reptiles and ferrets. Broad spectrum de-wormer/anti-parasiticide. For oral administration in the prevention and treatment of infections caused by internal parasites, including Encephalitozoon cuniculi. Lapizole is only for use in rabbits, birds, reptiles and ferrets. Do not use in animals other than those indicated. Do not use in pregnant animals. Do not overdose. In birds, fenbendazole can cause intestinal problems and inhibit bone marrow production. Do not use in nestlings/growing birds or those in moult. In some mammalian species, high doses of fenbendazole can lead to bone marrow suppression, gastrointestinal tract irritation and problems in pregnancy. Do not overdose. As with all veterinary medicines, occasional instances of allergic response due to prior sensitisation, drug intolerance and idiosyncratic reactions may occur. For animal treatment only. If you are uncertain about the condition of your pet, consult a veterinary surgeon. If symptoms persist, consult a veterinary surgeon. Avoid contact with the skin. Wash hands with soap and water following treatment. No data available. Do not use in pregnant animals. Suspension for oral administration. Weigh animal carefully before administration to accurately assess the appropriate dose. Shake the bottle well before each daily administration. Using the easy dose syringe: Remove the cap and peel off the foil bottle covering. Place the plastic plug into the neck of the bottle. Push the syringe firmly into the plug (hole) in the neck of the bottle. Turn the bottle upside down. Whilst holding the syringe in place, gently pull the plunger, drawing the liquid to the correct mark on the syringe. Turn the bottle the right way up and remove the syringe from the plug by gently twisting the syringe. After use, replace the cap. Wash the syringe in warm water and allow to dry. (Please refer to dosing guide). For pet animals only. Do not use in animals intended for human consumption. Do not eat the eggs of treated birds. Do not store above 25°C. Do not freeze. Protect from direct sunlight. Keep out of the sight and reach of children. No in-use shelf life studies have been undertaken on this product. Polypropylene container containing 100 ml of suspension and a dosing syringe. Dispose of waste material in accordance with local requirements. There are currently no questions for Lapizole - be the first to ask one!